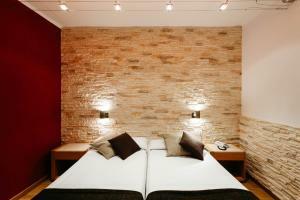 Hotel Travessera is situated just 600 metres from Gaudí’s Parc Güell, in a quiet area of Barcelona. Each air-conditioned room and apartment includes free Wi-Fi. The Travessera is located on the edge of Gràcia, a popular neighbourhood full of shops, bars and restaurants. Alfons X Metro Station is only 500 metres away. Regular buses to the city centre also stop outside the hotel. 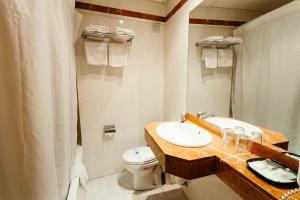 Each bright, functional room includes a TV and a private bathroom with a hairdryer and toiletries. Apartments with a small kitchenette and lounge area are also available. A daily breakfast buffet is served in the hotel's dining room. There is a 24-hour reception, and a tour desk with information about the city. Guests are kindly requested to inform the property of their estimated time of arrival. This can be noted in the Comments Box during booking or by contacting the property using the contact details found on the booking confirmation. Guests are required to show a photo identification and credit card upon check-in. Please note that all Special Requests are subject to availability and additional charges may apply. Please inform Hotel Travessera in advance of your expected arrival time. You can use the Special Requests box when booking, or contact the property directly with the contact details provided in your confirmation. These rooms have a private bathroom, TV and minibar. Please note that some rooms are interior-facing. 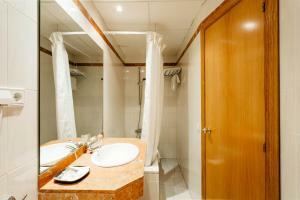 This room consists of 2 connected twin rooms, and 1 private bathroom including free toiletries and hairdryer. Bed linen and towels are provided. Please note this room is interior-facing. Rate: € 35.00 ... € 151.00; select dates below to get current rates. 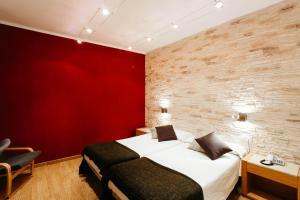 This modern, air-conditioned room is made up of 2 twin bedrooms and a bathroom with a shower. It overlooks an interior patio.